Assuming that the underside comprises fine pores, these might be old specimens of Polyporus badius. I've found morels associated with many different kinds of shrubs and trees, but I noticed that many of them are either in the willow family or in the rose family. Some examples that I've experienced: willow, cottonwood, aspen, English Laurel, cherry, apple, and plum. Since hawtherns are in the rose family, I'm not surprised about that association and have been checking them out whenever I see them. The only type of tree outside of these two families that has produced for me is ash. This applies to natural morels in the Pacific Northwest that reappear consistently in the same area. Burn morels are different and primarily occur under many different conifers, especially pines. I'm sure that different associations occur in eastern North America, but I think that most of the above examples apply there as well. I think that it is more likely that Verpa bohemica rather than any Gyromitra would be mistaken for a true morel. Here is a photo from 2011 showing a V. bohemica that has darkened ridges similar to black morels. You have to look closely to note that the bottom of the cap isn't attached to the stem. Also, I've read that these Verpas are available commercially in Europe, as well as North America. I presume that they would be more dangerous than true morels if undercooked. Please help me, what is this?? This reminds me of oyster mushrooms sprouting from grow kits, but it will be difficult to ID such immature buttons. If you can find an older specimen and provide photos of mature gills, caps, and stems, it will help a lot. 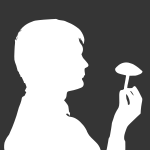 A spore print would also be very useful, but you won't get one from these. They don't look like anything dangerous. It could be algae that give it that green color. Note that the article says that 11 other diners suffered from symptoms similar to those of the person who died; so, it was not likely to be an allergic reaction. I suspect that it was a case of undercooked morels. There was a similar incident at a wedding in Vancouver, BC, some years ago. Quite a few people became ill from raw morels in a salad provided by the caterer. Including a picture of the entire stem of the mushroom would help a lot for identification. Assuming that these are a saprobic type of morel, they probably won't fruit again, at least not in the same area where they have used up the available nutrients. If there is a lot of mulch around, they may spread to and fruit in another area that has not been colonized yet. Another possibility: they may fruit again if you add some more of the same kind of mulch that they are already growing in. A couple of hours in a ziploc bag won't hurt, as long as they're not exposed to direct sunshine. Both H. chlorophana and H. flavescens are listed for Washington state in "Pacific Northwest Distributions for Macrofungi", Website: http://www.svims.ca/council/distri.htm , along with several other yellow Hygrocybes. Help ID please. Poisonous or edible? With Boletes, staining reactions can be critical for identification. Did you notice any blue staining after handling the mushroom? There appears to be a faint blue streak across the pores in the 2nd photo. If they were growing in clusters on buried wood and have a white spore print, they might be old specimens of Flammulina velutipes.